Welcome to entertainmentdirectories.net. Many of the entertainment directories that include record companies, managers and booking agents are published by Music Connection. Our talent buyer directories are published by us. We spend countless hours getting the important information and contacts you need to get booked. We do our best to offer more resources than any other directories. Our data is collected from several sources including the listees their selves. Our talent buyers entertainment directories are often used by the entertainment community and by song writers, musical acts and entertainers. These entertainment directories are critical for those trying to make connections to take their career to the next level. To get access to our talent buyers directory you will need to registrar and subscribe. There are many benefits of being a subscriber such as free classifieds, discount web design services, support and consultation. If you got any questions you can email us or call. 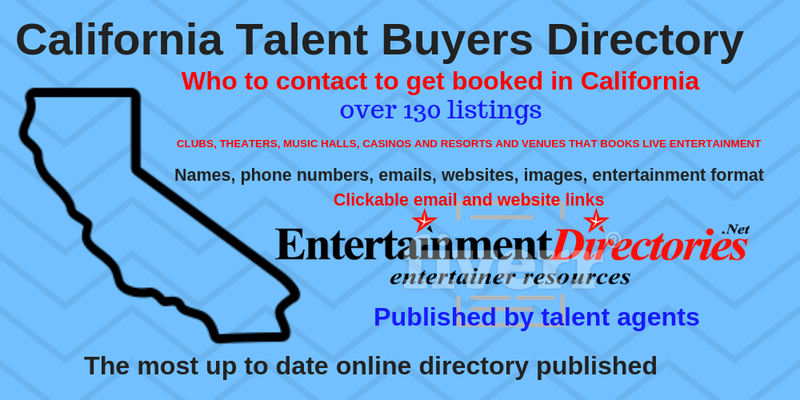 Our Las Vegas Talent Buyers Directory is now available on this website. Subscribe and get access to the most complete Las Vegas Talent Buyers contacts published..Names, numbers, emails. Also included is surrounded locations for more options.